Protect your statements of accounts, insurance policies, contracts, invoices, mistyped letters or notes from prying eyes!The compact size of these small and home office document shredders makes them particularly suitable for use at home or in small offices. 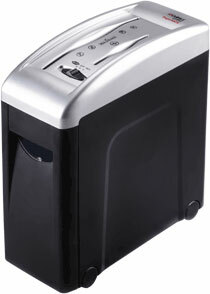 Document shredder with automatic start/stop and reverse function. Viewing window to show when the shredder is full. Motor cuts out automatically on opening the shredder. 2 cutting units for paper as well as CDs, DVDs, cheque and credit cards. Standby mode without using electricity. Stable construction from unbreakable plastic material. To empty the waste basket, just lift off the top part. User-friendly operation.